The holidays have come and gone, and while Christmas is a ton of fun for almost everyone, the aftermath of the holidays can be discouraging and overwhelming. After Santa paid a visit to my children and the gifts had been exchanged with friends and family I stood in horror looking at the disaster Christmas left in its wake. New toys and clothes were piled upon old toys and clothes...boxes and bags littered just about every surface. Scraps of paper were scattered here and there. Then we get into the bedrooms, where it was every bit as bad, except figure in that laundry, and random things like a new booster seat, were stashed in those rooms at the last minute before the family arrived to celebrate. Just a few weeks ago I went on a cleaning spree. If you follow my Dear Weary Mom series you might remember the box of burdens post. I filled a huge box up and took it to Goodwill and Community Action. Despite that massive decluttering, my house needed another overhaul to accommodate Christmas. When I really thought about it, my house needs another round of decluttering, a deep clean and a massive organizational effort. My family of 4 with 2 dogs resides in a very small house, only about 890 square feet. We have outgrown this house to say the least, but we are trying to stay here for at least 6 months. To last another 6 months in such a small space with a growing family is going to be difficult if I don't find ways to make the space we do have work for us. With this in mind I have been collecting ideas, sketching plans and making lists of projects that I want to tackle to whip my home into shape. 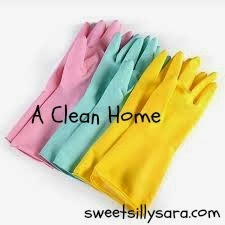 Each post in the series A Clean Home will feature an inexpensive way you can clean or organize something in your home. The first Challenge I gave to myself was to select 50 Items from my home to donate to Goodwill. I gave myself 2 days to gather my 50 items. Among the 50 items I had 6 towels, 2 top sheets, 3 blankets, 5 pairs of socks, 8 toys from my sons room, 2 sleepers of Harper's. 5 kitchen knives, a cheese grater, a reusable bag, a measuring cup, dog grooming products, an outgrown coat and pair of bibs, baby shoes, 3 handbags, 2 clutches, 2 hats, a book, a few magazines, 2 bottles of shampoo I didn't like, a scarf , Christmas lights and a few t shirts. I exceeded my goal of 50 items and filled 2 medium size boxes. I still plan to sort through stuffed animals and pull 5 out for a donation to Goodwill, and I suspect there are a few more towels that won't make the cut for keeping, both bath and hand towels. Now that I have reduced the amount of clutter in my house it is time to start organizing. I hope you will keep coming back to read more about my challenges in this series. Next time, we will talk about a very messy drawer in my house and how I plan to get it under control. Great idea. I am starting a declutter challenge today for 6 days you get rid of 10 items a day. I hate clutter.